Morning glory (Ipomoaea spp.) is a fast-growing vine with a profusion of flowers in summer. The flower has earned its name by opening early each morning and shriveling up by the heat of the afternoon. 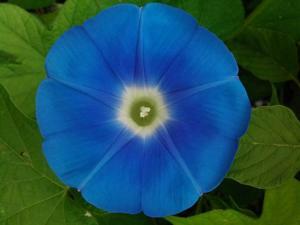 Morning glory flowers open with a shape like the end of a trumpet and are typically two to four inches in diameter. Blue is the most common color, but pink, purple, red, and white varieties are available. The leaves are also quite attractive - they are deep green heart-shaped orbs about four to six inches in diameter. The vines grow quickly to 10 feet or more in summer though they are just as quickly decimated by freezing weather. In USDA zones 9 and 10 morning glories are grown as a perennial. In other zones, they often reseed themselves in the same place each year. All parts of the morning glory plant are toxic if ingested. Morning glory is a great choice where a quick splash of lush foliage and colorful blooms are desired. Use them to conceal an ugly chain link fence or to spruce up the front of the home or any neglected space in the garden. The vines stay thin and supple and require only a lightweight trellis, arbor, or pergola to support them. If nothing is provided for them to grow on, they will grow along the ground as a lush groundcover. 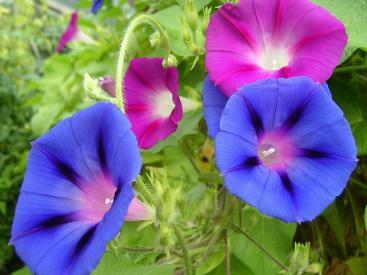 Morning glory starts may be found in nurseries, but the seeds are almost universally available at retail garden centers, as this is the preferred way to start the vines. First, soak the seeds in a wet paper towel overnight to aid the germination process. Then plant them about a half-inch deep in loose rich soil. The seeds are easy to start directly in the ground after all danger of frost has passed in late spring; or they can be started indoors in small pots about six to eight weeks before the average date of last frost. Morning glories bloom most profusely with full sun, rich soil, and regular irrigation. However, they are tough and adaptable plants and will survive and flower in less than optimal conditions. In fact, they have a tendency to grow a little too well and often seed themselves where they are unwanted. Growing them in a pot on a patio, deck, or balcony helps to prevent them from becoming weedy. Watering and training the vines to grow on the trellis provided for them are the primary maintenance tasks with morning glories. They are very easy to grow and virtually never suffer from pests and disease. If slugs or snails are a big problem in your garden, however, you may need to protect young morning glory transplants with Sluggo or other repellents. At the end of the season, cut the vines to the ground and remove the dead plant material from the trellis. Try mixing several morning glory varieties of different colors together in a single planting for a dramatic effect. 'Heavenly Blue' has light blue blooms with white stripes. 'Pearly Gates' has solid white blossoms. 'Scarlet O'Hara' has red flowers with white stripes down the throat. 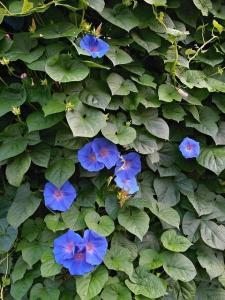 Morning glories have the freshness of dawn. Each day, new buds open to replace the faded flowers from the day before and remind us that there is always an opportunity for renewal.